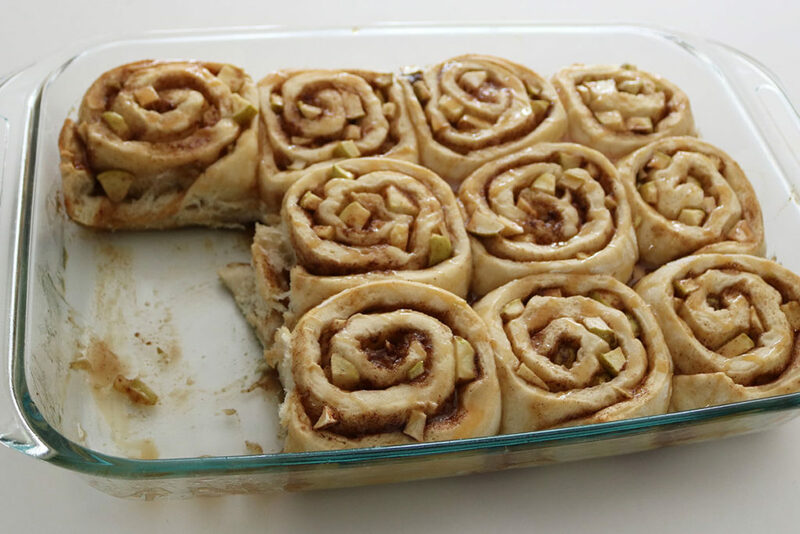 Caramel Apple Cinnamon Rolls - Homemade Cinnamon Roll Recipe! 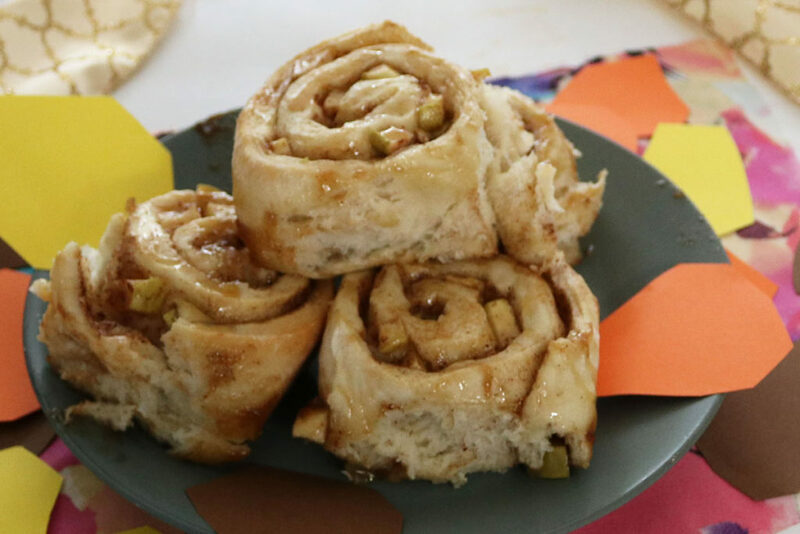 These caramel apple cinnamon rolls are filled with cinnamon, brown sugar, granny-smith apples and drizzled with caramel for the perfect fall breakfast! I’m just going to start out with a warning here. If you ever want to enjoy cinnamon rolls from a can again, you might not want to make these. These homemade caramel apple cinnamon rolls are that good. They will spoil you. And you will only ever want the fresh from the oven, homemade version. This breakfast does take a little prep work, but it’s all pretty simple and so worth it! 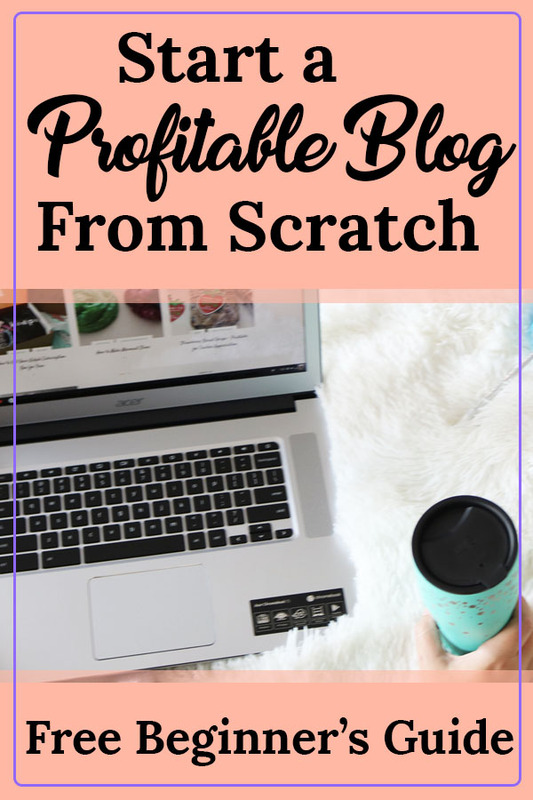 I found the recipe over at Little Spice Jar. We still have quite a bit of apples left from apple picking at Sky Top Orchard and decided to give this recipe a try. I’m so glad we did because it really is that good. It is one of those recipes that turned out better than expected. We made a few tweaks to the recipe and made it “make the night before” friendly. Waiting 2 hours for breakfast to be done isn’t something my kids are usually patient enough for. 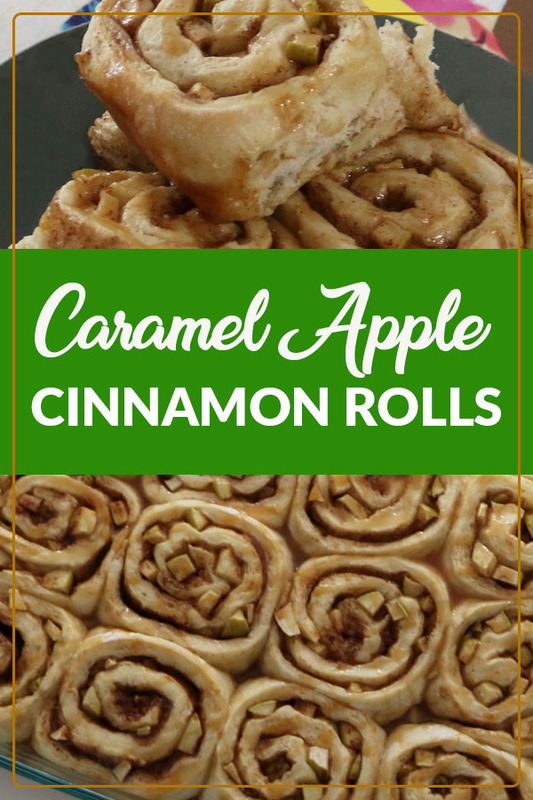 But if you prep them the night before, all you need to do is pop them in the oven in the morning and you have amazing, homemade caramel apple cinnamon rolls in just 20 minutes! I have to talk about this picture for a minute! 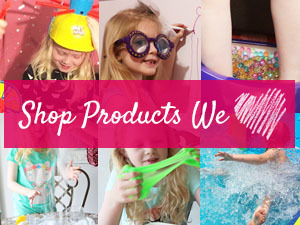 Blogging has been so fun for the girls and me to spend fun ways together creating crafts… and their favorite, slime! They have always been really good at helping me come up with the content. But lately, Abigail has taken an interest in helping me stage the pictures. She really wanted to be the one to stage this picture. So I gave her full creative control. From cutting out the leaves, to placing the cinnamon rolls on the plate, the staging of this picture is 100% hers! And she really nailed it… at just 6 years old! I can’t even begin to tell you how amazing it is to see this create side emerge from her. From the time it took her to cut out the leaves and choose the perfect fabric, so much love and thought was put into this. 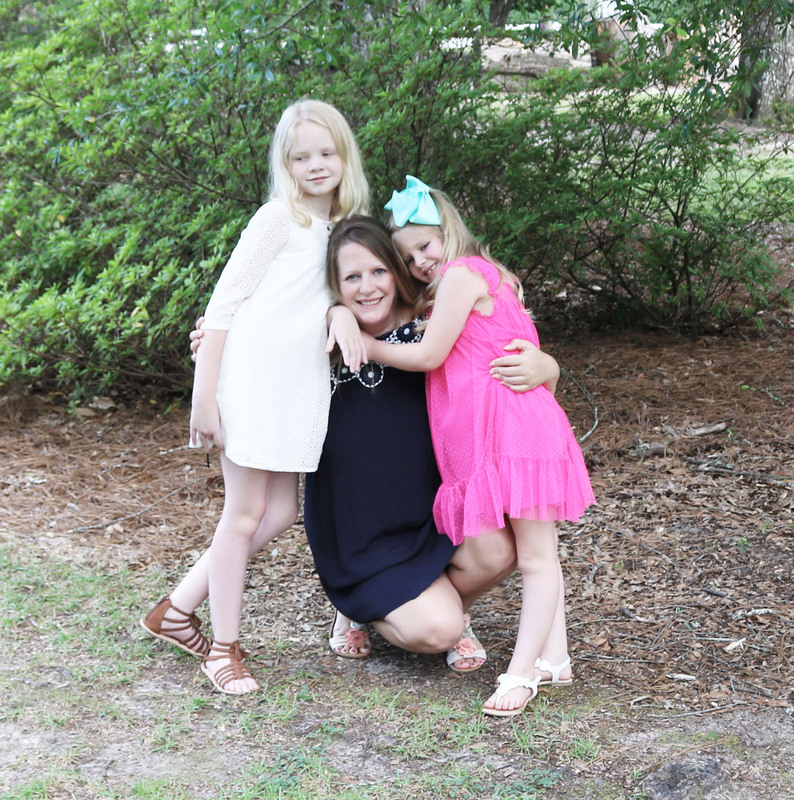 It’s just one more reason why I love blogging and constantly find myself saying, “I can’t believe I get paid for this!” To be able to incorporate family into my career is everything I’ve ever wanted! 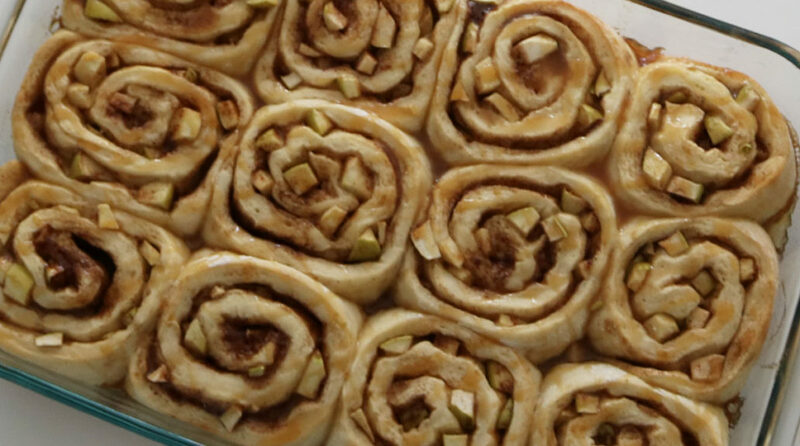 These caramel apple cinnamon rolls are really easy to make. The prep works doesn’t take much time, but there is a little waiting for the dough to rise. However, this can be done over night in the fridge if you prep them the night before. It makes 12 delicious cinnamon rolls and can be baked in a 9×13 pan perfectly. The dough ingredients are pretty basic. You probably already have them all on hand: flour, sugar, butter, water, yeast, milk and an egg. 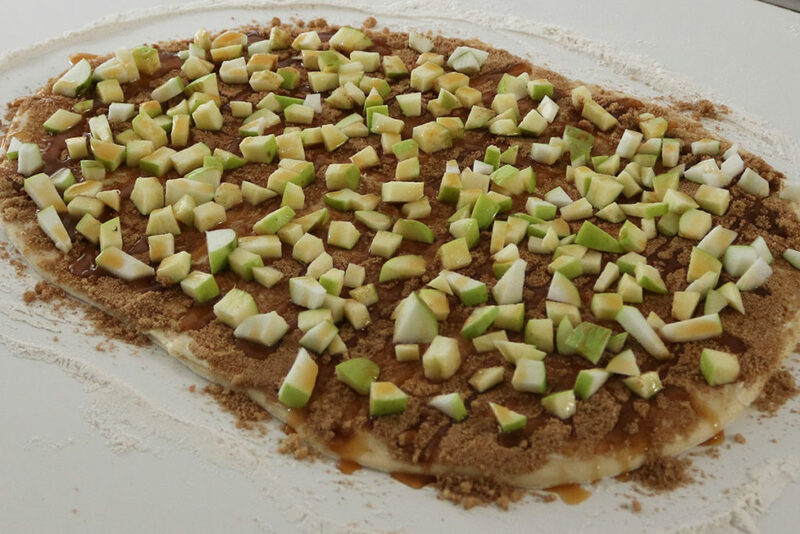 The rest of the ingredients are just as simple as well: granny smith apple, brown sugar, cinnamon and caramel sauce. I used store bought caramel sauce, but you are more than welcome to make your own. To make the dough, you will need a mixer with a dough hook attachment. I used my stand mixer for this. You could probably knead the dough for awhile if you don’t have a dough hook or mixer to do this with. I haven’t tried this method though. 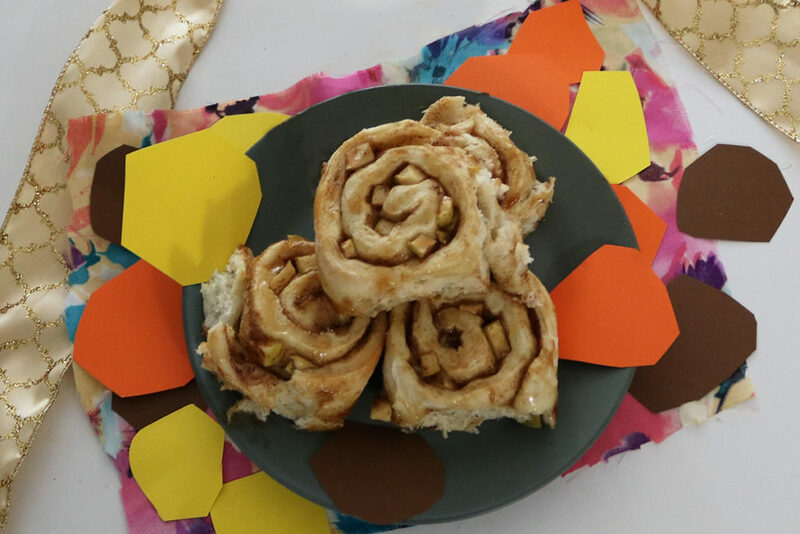 I would recommend giving the kneading a try if that is your only option because you do not want to miss out on these caramel apple cinnamon rolls. Trust me on this one! I recommend you go ahead and make these this weekend. 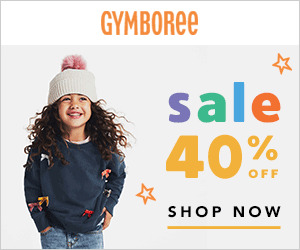 Your family will thank you! In a microwave-safe bowl, combine the milk, water and butter. Heat on high for 1 minute, remove and stir. Heat for 30 seconds and stir until butter is completely melted. In the bowl of an electric mixer with a dough hook attachment, add 3 cups of flour, sugar, salt and the yeast. Add the warm milk mixture and the egg. Beat on medium-low speed to combine. Slowly add the remaining 1/2 cup of flour until the dough no longer sticks to the sides. Add more as needed. Continue running the dough for another 5 minutes on the medium-low setting. Remove dough from hook and cover dough with plastic wrap. Let the dough rest for 15 minutes. While the dough rests, make the cinnamon brown sugar filling and chop your apples. In a small bowl, whisk together the brown sugar, cinnamon and ground nutmeg until combined. When the dough is ready, place it on a lightly floured work surface. With a floured rolling pin, roll out the dough into a 14x10 inch rectangle. Using a small spatula, spread the softened butter out evenly over the entire surface of the dough. Sprinkle evenly with the cinnamon brown sugar mixture. Top with apples and drizzle about 1/2 cup caramel sauce over top. Roll up the dough tightly, cut into 12 even pieces and place in a lightly greased 13x9 pan. Loosely cover the rolls with a towel and allow them to rise for 45 minutes. Or you can place them in the fridge overnight. When the dough has risen, bake at 350 degrees for 15-20 minutes. Remove and allow to cool for 5 minutes. Drizzle with caramel sauce and serve warm. 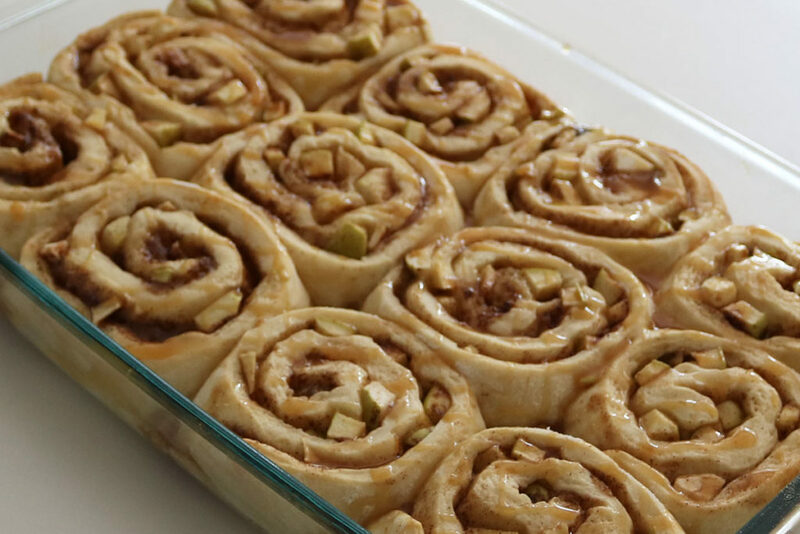 Don’t forget to pin this delicious caramel apple cinnamon roll recipe to make! We are huge cinnamon roll fans here! I will have to try to make them with apples. Yum! I used to make cinnamon rolls whenever my daughter had a sleepover – letting them rise overnight. I haven’t done that in years – need to bring it back!!! With fall quickly approaching, this looks like a perfect treat to bring it in. Oh my goodness this looks amazing! I can’t wait to try it! Can I just say WOW….i’d never be able to pull that off. great job! Those look delicious! What an amazing way to bring in the fall season! I love the idea of adding apples. They look delicious! 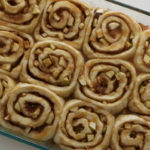 I love that you add apple into the cinnamon rolled, more yumminess! Oh my gosh! These look delicious! And your daughter did a beautiful job staging! These look so delicious! I love cinnamon rolls and adding apples sounds perfect!!! I will have to give them a try! My husband loves caramel apples and cinnamon rolls! Can’t wait to make these for him! I’m going apple picking soon and this recipe is perfect! This looks delicious and worth every bit of effort. I think these would be amazing for a decadent Sunday breakfast. This looks amazing! Must try this! Oh my goodness! These look decadent! That looks a lot easier to make than I ever thought! Now I feel silly for not giving cinnamon rolls a try earlier! I will definitely be making those asap!! Cinnamon might be my favorite spice, and these look scrumptious! 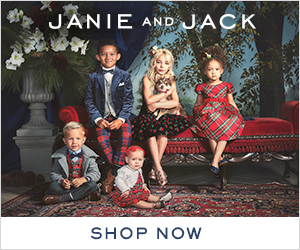 Damn… this is the stuff of dreams. I don’t know how I’d handle being able to make these myself – I’d never be able to save any for later!